The first column of the table lists the months, starting with month XII of the year 133 b.c. Following this are months I through XII for the year 132 b.c. The second column lists how far the Sun moves in each month. 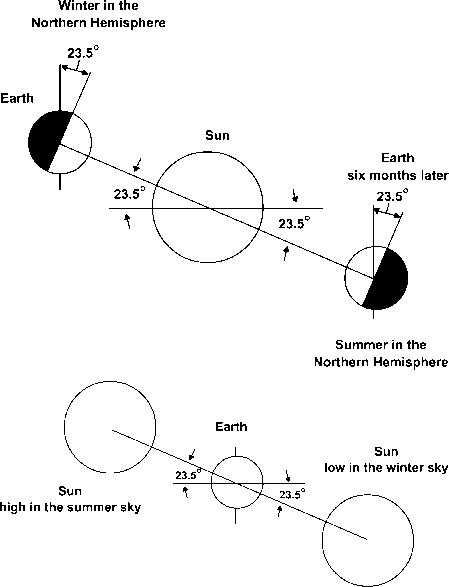 During month I, the Sun moves 28 degrees, 37 minutes, 57 seconds, and 58/60 second (line 2, column 2). Add this movement to the position of the Sun at the end of the previous month (line 1, column 3), and the result is the position of the Sun at the end of month I (line 2, column 3). The third column gives the position of the Sun. It is obtained by adding to the initial position the amount of motion during the month, listed in the second column. For example, adding the top line of the third column and the second line of the second column produces the second line in the third column—after subtracting 30 degrees and listing the position 30 degrees ahead in the next segment of the zodiac. The fourth column is the house of the zodiac in which the Sun resides that month. Each house of the zodiac occupies 30 degrees, one-twelfth of the 360 degrees of a complete circle. The table shows a decrease of 18 minutes in the distance traveled by the Sun from one month to the next for months I and II of this particular year (132 b.c.). For months III through VIII, there is an increase of 18 minutes in the distance traversed each month. In the last four months, the distance is 18 minutes less in each consecutive month. Within each of the three groups of months, the last two sets of numbers in each line of the second column, the solar motion, are unchanged. Obviously, the numbers are not actual observations but have been calculated by adding or subtracting 18 minutes from each preceding line. The decreasing, increasing, and again decreasing sequence of numbers in the second column (the Sun's motion) is now called a "zigzag" function, reflecting its appearance on a graph. Babylonian astronomers also used a system in which the solar velocity remained constant for several months, after which the Sun proceeded with a different constant speed for several more months before finally reverting to the initial velocity and remaining at that speed for several more months. Graphed, the motion looks like a series of steps up and down, and it is called a "step" function. Zigzag and step are useful labels but potentially misleading. Babylonians are not known to have used graphs. Nor do we have any evidence that Babylonians constructed geometrical models of the motions of celestial bodies. Nor did they express concern about the causes of the motions, at least not in the tablets found and studied so far. Nor did they express any curiosity about the physical composition of the celestial bodies. The goal of ancient Babylonian astronomy seems to have been to predict astronomical appearances but not to make sense of them. Predicting positions did not require any theoretical ideas about the celestial bodies. Some historians of science celebrate the high level of mathematical t heory in late Babylonian astronomy as the first appearance of modern science. The historian of ancient science Otto Neugebauer concluded that Babylonian astronomical texts of the Seleucid period are scientific because everything has been eliminated from the astronomy except observations and the mathematical consequences of an initial hypothesis about the fundamental character of the movements. He admitted only mathematical computation together with empirical observation as the necessary characteristics of science and denied any role to speculative hypotheses of a strongly theoretical nature. Using the translated Babylonian ephemeris for the position of the Sun in the years 133-132 b.c., do the calculations to find the position of the Sun at the end of month V for the year 132 b.c. future positions of the planets, the Sun, and the Moon. They studied how the celestial motions went but not why. Nor did they seek to develop a single comprehensive mathematical scheme encompassing all their data. Many historians of science look instead to the Greeks for the birth of modern science. Greek astronomers dealt with planetary motions differently than did the Babylonians, as we will see in following chapters.